We are available to provide a comprehensive service in organising events, fully developed by our team.What sets us apart from the competition are our facilities, it's the "smell of grass" and the "thrill of football" - moments lived in the Sport Lisboa e Benfica stadium bring a great motivational load, carried to the brands which visit us. To this thrill of emotion, we add the best suppliers in the market for the wide range of services we offer to our customer. We work with the best and carry this level of demand to all events we host. You can contact us to host galas, teambuilding actions, conferences, seminars, corporate dinners, product launches, among others. If you haven't made up your mind yet, our team will design a tailor-made event, offering you a "Turnkey" project. Among many differentiating products, we mention two created by our Event Department for a market that also intends to innovate with its clients: Official Hospitality Agent and Football Experience. Would you like to become a partner? You can join our team and be an Official Hospitality Agent. 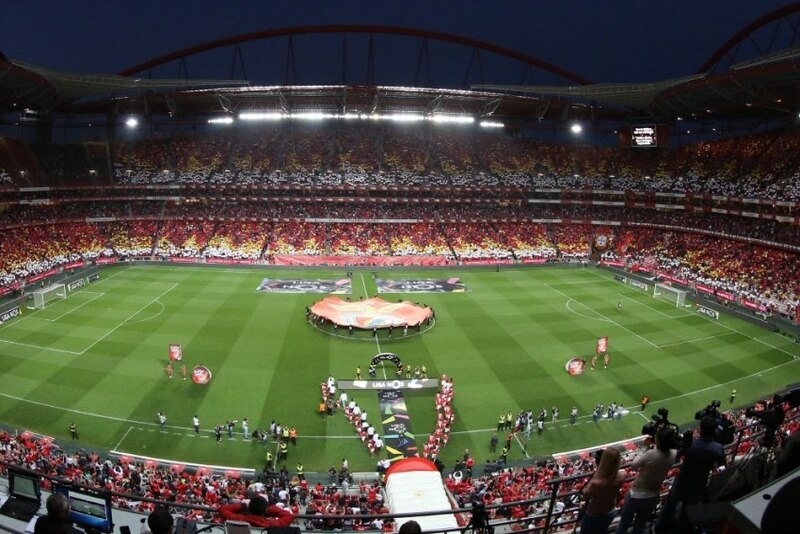 By becoming an Official Hospitality Agent, your customers will have access to SL Benfica matches with some complementary services, turning this into a very competitive product. We also offer the Official Hospitality Agent logo to promote this service during the 2017/2018 sports season. Each unit in this pack includes a match ticket, a scarf, a Benfica Cosme Damião Museum tour, a meal ticket at any Benfica Fan Zone restaurant or at one of the stadium's bars, 20% off at Benfica Official Store and Online Store and a 5% discount at Adidas. Contact us to know more about this new product, how many competitions we are participating in, what matches you can enjoy in these seats, conditions for booking and the maximum number of tickets, per match, you can make available to your customers. Football Experience is one of our premium products. With it, we guarantee a unique and memorable experience to your customers, employees and partners. The goal is to play a football match as if it was an official competition game, in which all participants feel like players of Sport Lisboa and Benfica's first team and live a CHAMPIONS experience. Start with inviting 40 partners or employees and bring them together in your company. SLB goes to your office, on the club bus, to pick up these stars to live a unique experience in a Portuguese stadium considered an icon of modernity, safety and comfort. We allow the use of SLB facilities for four hours: the main pitch, shower rooms for both teams and the Presidential Tribune for guests. Two hostesses will wait for the group and follow it. The match can have the normal 90 minutes, but it will be up to you to understand how fit your players are. You will find personalised equipment for each participant, as well as fruit and water. To create a more footballing environment each team will have an SLB glory as coach who will help creating the motivation any team needs to step on our pitch. There will be a refereeing team, physiotherapists and balls to perfectly mimic an official match. Our speaker will help create the GLORIOUS environment we are used to, will call our eagle Vitória, align the teams and call each participant to the microphone, and vibrate with each goal. Sound and mega screens of the stadium will be used. Your company can prepare contents to simulate stadium environment. Our BTV will follow up on the event and make a memorable video of Perhaps a group member can take a leading position and participate in a motivational talk, along with our glories, in the dreaded press conference room. You can also consider bringing guests to watch the game in the Presidential Tribune and finish the morning or afternoon with a fantastic meal, in one of the stadium's exclusive rooms. Once more, there are many services we can add to your event, such as cheerleaders, personalised merchandising for guests, medals and trophies, and many others. We have a very competent team, excellent services and a unique experience to provide you with. We are waiting for you!